Enhance the taste of your coffee or tea with this Hood .4 oz. shelf-stable aseptic creamer! Each convenient .4 oz. portion control cup makes the perfect addition to any self-serve coffee station in your convenience store, lobby, reception area, hotel breakfast bar, or employee break room. 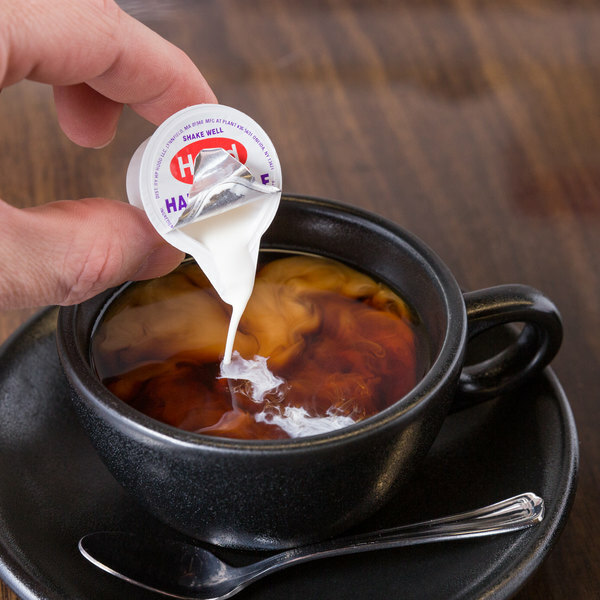 Ideal for individual use, each creamer adds a classic, smooth and creamy taste to any hot beverage. "We purchased these little creamers for our customers to use with their coffee and everyone seems to really enjoy them. We have to re stock them every day! It is the perfect size for our coffee station too." 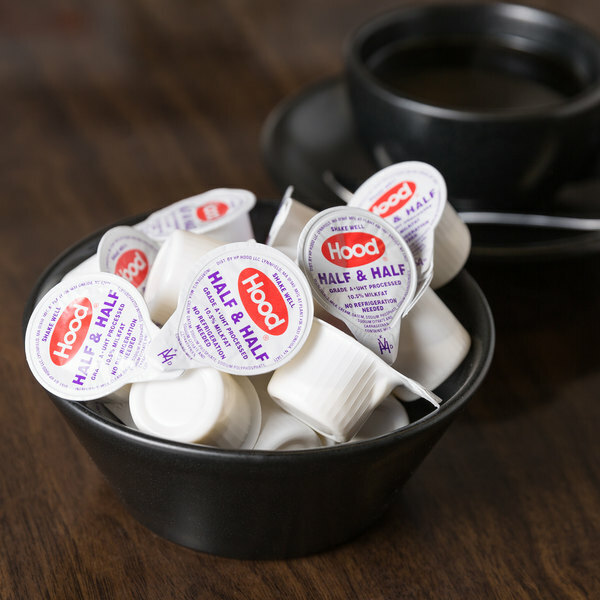 Compared to bulk canisters of creamer, each pre-portioned cup contains just the right amount of creamer for a steaming cup of coffee or tea. Your patrons can order their hot beverages for take-out and grab one of these portion cups to take with them on the go! 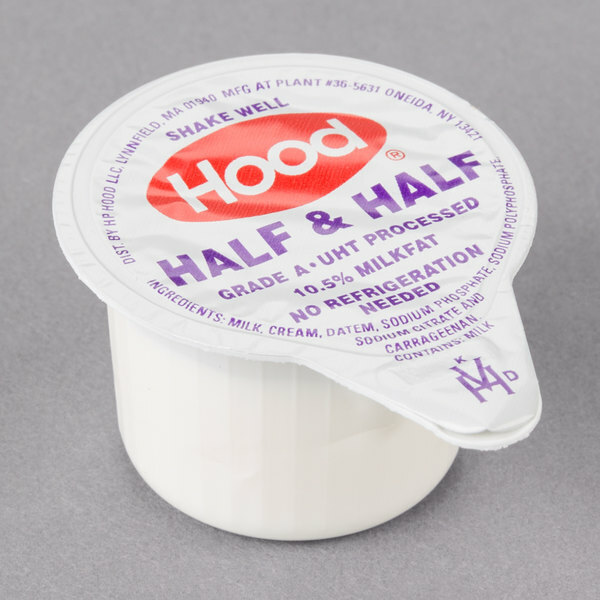 These Hood pre-proportioned cups can be stored between 33 - 80 degrees Fahrenheit, reducing costs due to spoilage and lost product. For best quality, we recommend consuming product within three months of the manufacturing date printed on the box. These creamers were super convenient for our coffee bars. I wish they lasted longer or came in smaller quantities because we wasted a lot from not being able to use them before the expiration date. This is good item to serve many congregation and cheap comparing with other shop. However if the number of people to serve is not very high it will be too much. Good shelf stable creamers for the money. These little guys taste great and can be kept on tables without fear of spoilage. This is a never to be without item. So much cheaper than the name brand. I really like the size it helps with portion control. 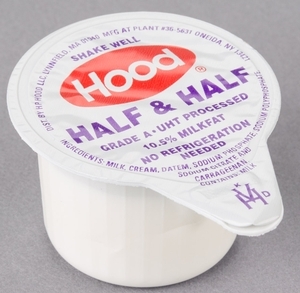 We use to put out little containers with half and half. Now we don't have to worry how much they use. Rich and creamy, these portion control creamers are great in store, on the go, and even at home. 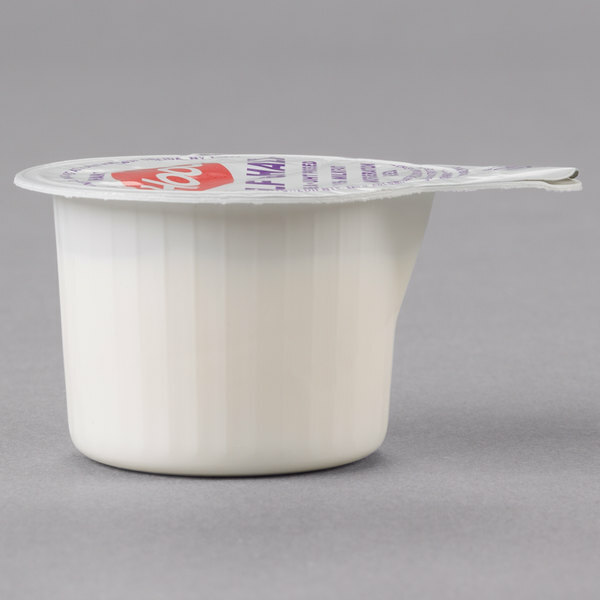 With an extended shelf-life, these little cups last much longer than dairy creamers and are so smooth and tasty, no one will notice the difference. They're economical and will be a big hit in your customers' coffee, or any hot beverage. I highly recommend this product. These creamers are great! We sell a lot of coffee at our shop, and our customers love to add these Hood creamers to their drinks. These do Not have a long shelf life. Customers seem to enjoy them. Great for the price. Just realize they need to be used quickly. We purchased these for our guests to have with their coffee in the morning. The only problem is that the expiration date on these was within 2 months of the purchase and we do not go through a quantity large enough to purchase from here. We ended up having to throw 1 1/2 boxes away of these because we didn't go through our order of 2 boxes by the expiration date. The quality of the product was good however. There is not much to say about this creamer. It is just like the other 100's on the market. The price will make me continue to purchase it. this creamer product is great in tasty and it has just the right amount of cream per cup to at just the right price aswell thank webstaurant. 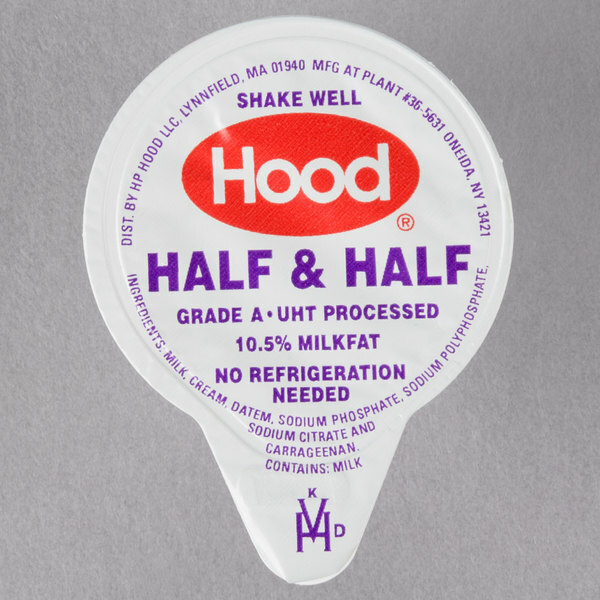 The Hood shelf-stable aseptic creamer is terrific and the perfect pairing with a cup of tea or coffee. The shelf stable aspect is huge for our catering business because refrigeration is not always an option. It should be noted by purchasers that the shelf life is limited. On my first order, I ordered a couple extra to get a better price, not realizing that the use by date would be 6 weeks from when I received the item. There was nothing wrong with the product, but just though others should know about the use by date. Thank you for your review. For best quality, we recommend consuming product within three months of the manufacturing date printed on the box. I like that it does not have to be refrigerated. I use this for my Thai Ice Teas and it works awesome! Sames fridge space. Creamers taste great. The are packaged very well in the box so there is no leaking. Be sure to need a big box as if they go past their experation date they will curdle. We use these very rarely, but they work well for large orders to go, boxes of coffee, and the like. AS a specialty shop we try and stay away from these, but they do the job. Good size for the coffee?easy and convience?Less than other brand but still tasty?I will recommend for coffee shop and small cafe?Customers can use whatever they want? I LOVE that I don't have to remember to put these in the fridge. I can just leave them out at room temperature 24/7 and they last until their expiration date (which is a long time away and we will use all of them before that). These creamers really save me time and money and peace of mind.